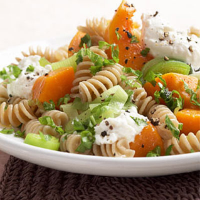 Wholewheat pasta is low-GI, giving a slower release of energy than the white variety, and tastes nice and nutty. Ricotta adds richness, too. Steam the pumpkin for 20 minutes or until soft. Meanwhile, cook the pasta in plenty of salted, boiling water for about 7 minutes until tender but still al dente. Heat the olive oil with 175ml water in a pan. Put the leeks in and gently cook, covered, for 10 minutes until softened. There should still be some liquid left that will keep the pasta moist when it’s mixed in. Drain the pasta, return it to its pan and toss with the leeks, pumpkin and nutmeg, seasoning well. Divide between warm plates. Spoon Ricotta onto the pasta and sprinkle the parsley over, or for a greater wow-factor, drop teaspoons of Ricotta into the chopped parsley, then place on the pasta so that it melts on the way from kitchen to table. Light, edgy white Vinho Verde is lower in alcohol (11.5 per cent) than most, and brings zing to the pasta.